SysTools is one of the leading company that provides data recovery, digital forensics, and cloud backup solutions. Recently, SysTools has joined hands with India’s biggest online store that is Flipkart. Both of these companies focus on providing the best products to the customers. Therefore, they collaborated together to provide simplified data management, data migration and data recovery solutions to the users. There are numerous solutions provided by SysTools to resolve users issues related to data loss, data migration etc. Now, the good news for all the users is that they can purchase SysTools products range from Flipkart. The users face issues while transferring data from one place to another, creating the backup, recovering deleted data and much more. SysTools always experiments with technology to provide best and reliable solutions to the users. They are having a great range of products to help the users to manage the data while migration, file conversion, backup, recovery etc. They always aim to develop safe and secure products. On the other hand, Flipkart is a well-known e-commerce marketplace to sell the variety of products. The shopping experience of all the users with Flipkart is always great. 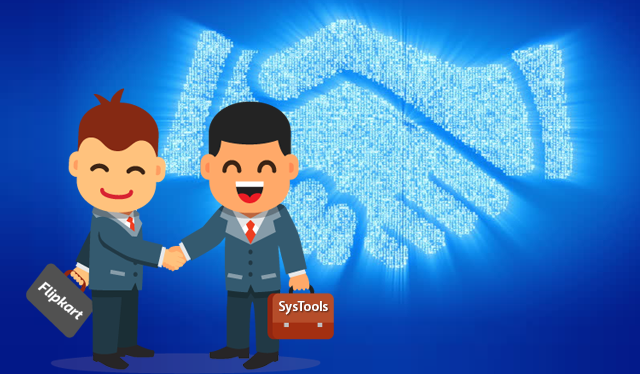 To make the user’s life hassle-free, SysTools and Flipkart teamed up together. Now, the users can buy SysTools products from Flipkart and can have a great shopping experience. SysTools always believes in providing simplified solutions to the users. Thus, all the software offered by SysTools are user-friendly, highly skilled, reliable, and cost-effective. The software help to perform various tasks such as data migration, data conversion, data recovery and much more. Additionally, all the applications offered by SysTools are completely safe and secure, they do not contain any type of malware. Moreover, data integrity and data security are maintained by all the products. So, the users can use them easily, irrespective of any data loss issue. SysTools is specialized in providing tools, using which the users can manage their data in a seamless manner. It is one of the most trusted brands that resolves all the problems related to data. The main focus of the organization is to simplify the technology and provide best results to the users. SysTools is touching the heights of success, with their amazing range of products and services. Now, they have teamed up Flipkart, which is the leader of the e-commerce marketplace to provide the best shopping experience with their reliable products.